Food Endeavours of the Blue Apocalypse: Making dumplings in my family - pork, prawn and chive dumplings. 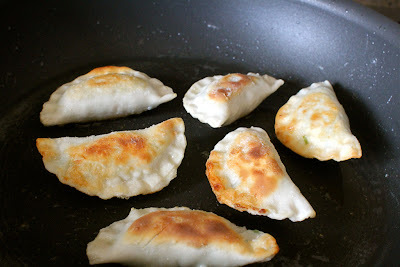 Making dumplings in my family - pork, prawn and chive dumplings. 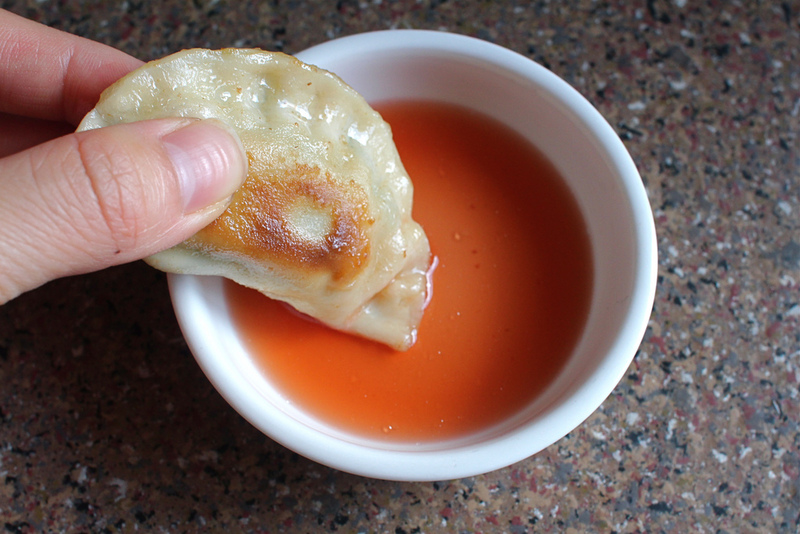 You can’t say no to making dumplings. Well not in my family. There are three kids in my family. I’m the oldest and I have a younger brother and sister. When my mother decides to make dumplings, we are all expected to help like it’s a call for national service. Even my brother who doesn’t cook and never lifts a finger to do anything around the house will be all hands on deck. And when my family makes dumplings, we make enough to feed a small army. As all mothers do, overtime my mother has developed little short cuts and time efficient processes into the making of dumplings. 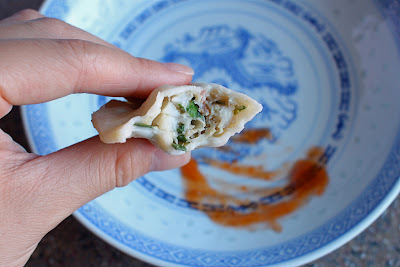 The dumplings wrappers are store bought but many were sampled until she found one that was as good as home made wrappers. Fancy pleats are no longer required but replaced by a curry puff shell crimper. In the end it’s about being practical. Dumplings eaten at home do not require fancy pleats, who’s judging? 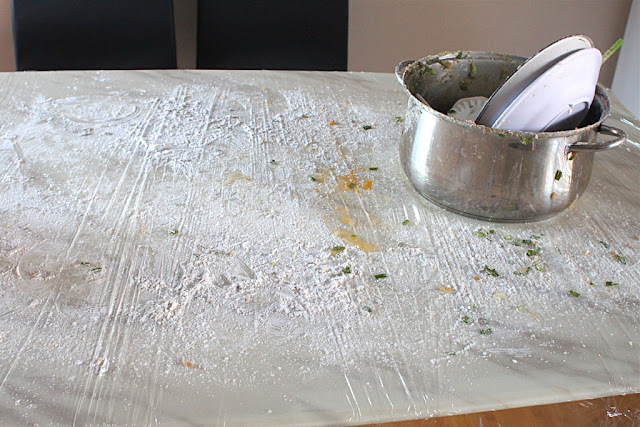 Another time saving/cleaning tip from my mother – wrap the table in cling film to save time cleaning up. If your mother is Asian or you have friends who have Asian mothers you will know that they have a tendency wrap cling film around things to keep it clean. The kitchen countertop near the stove it a regular cling film protected area from oil splatters and the remote control is a common casualty. 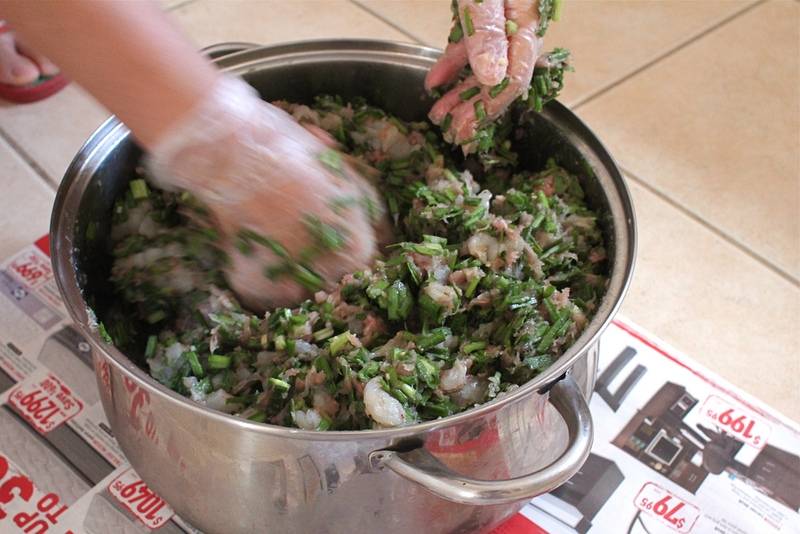 Even with all these time savers, dumpling making still takes up an entire afternoon – about an hour to prepare the filling (my mother does not skimp on the filling – she minces her own meat and uses fresh prawns, shelling and deveining at least 2kgs of it!) and up to 3 hours with as many hands on deck as possible pumping the little morsels out. 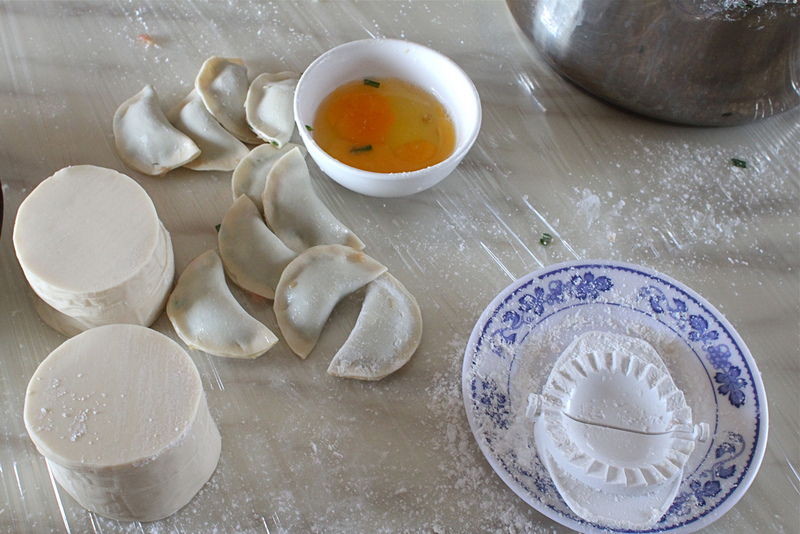 You can tell a lot about someone by how they make dumplings. My mum is methodic, fast and efficient, much like her approach to everything else in life. She somehow always gets the right ratio of filling in so that the dumplings turn out perfectly stuffed everytime, not too little and not too much. I, on the other hand, always take a few to get into the rhythm of things. I initially try to be fast as I think I know what I’m doing but it appears that the gap in time between dumpling making makes me a little bit rusty. I end up stuffing up and always overfill the dumplings. 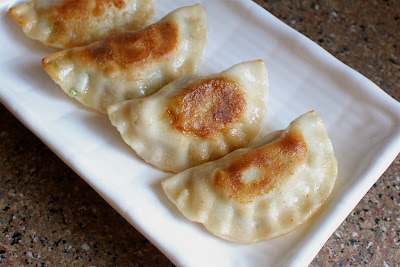 Or worse I will try to underfill them a little just to be on the safe side but no no this will be no good for my mother, every bite into the dumpling must burst with filling (I only try doing this when my mother isn’t looking but her eyes seem to have 360 degree vision). My mother will scold me, telling me I’m working too fast, always putting in too much or not enough, I need to take my time and think about what I’m doing more. Sometimes I’m not sure if she is referring to dumplings or life. But after a while I get into the rhythm of things and my dumplings start to look a bit more consistently regular. The good thing about making dumplings at home is that you know exactly what goes into the filling and you can alter the seasonings to your desired taste until you find the perfect balance of flavour. My mum likes to put in a heap of chives and also be generous with the prawns. 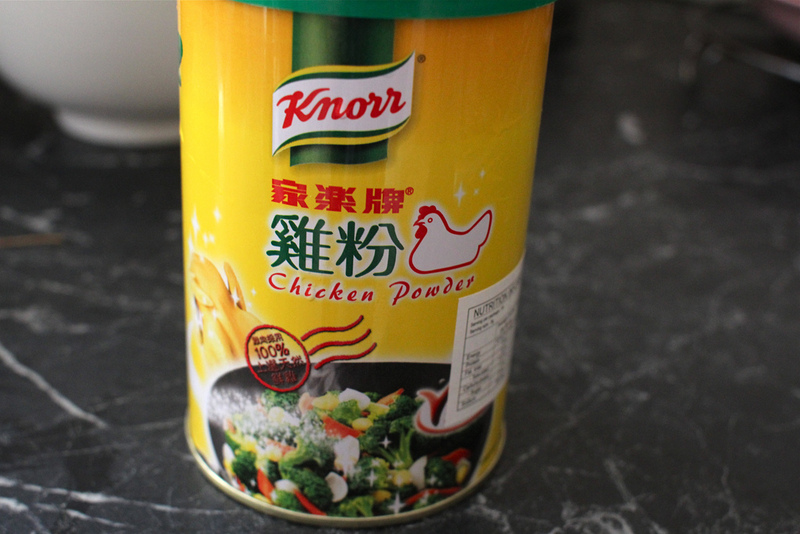 Chicken powder (!) what’s that? An appropriate name for it would be “I can’t believe its not MSG” because it’s basically used as a substitute for MSG and viewed as a flavour booster. 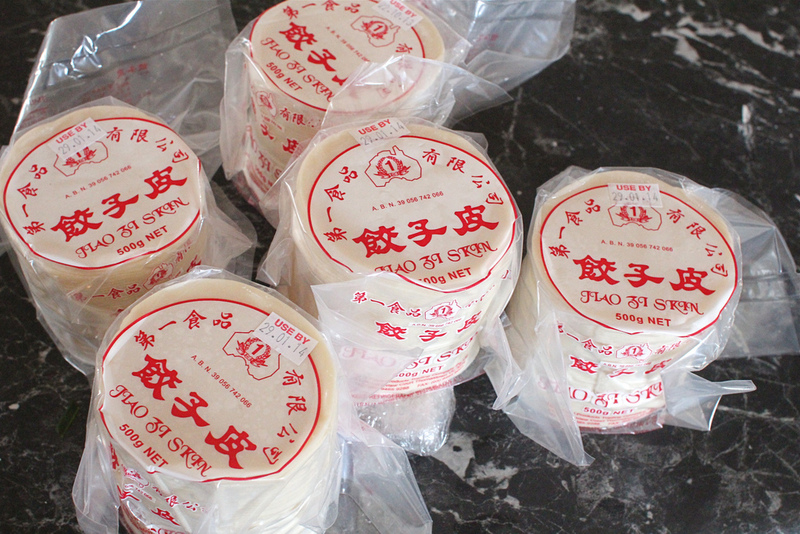 It’s something that you’ll find is a staple in a lot of Asian households. I’ve seen it listed in the ingredients in a few Chinese cookbooks and there are constantly commercials for it on TV when I’m watching TVB (aka Asian Foxtel) at my parents. 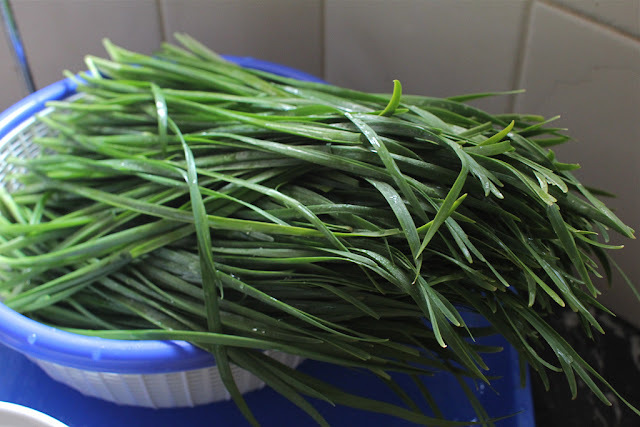 The truth is that MSG has always been a part of Asian cooking, but the bad rep it has received even though there is no evidence to support the claims against it, has given it a negative image so that people have overtime become more wary over the use of it. Thus, companies have acted to develop products that act in a similar manner to MSG but it’s not MSG. Got it? My mum always likes to add a little bit of chicken powder into the dishes she cooks to give everything a little oomph. Pour the seasoning mixture into the pot with the filling and combine everything together, kneading the mixture for 10-15 minutes until it develops some elasticity. Refrigerate for at least half and hour. 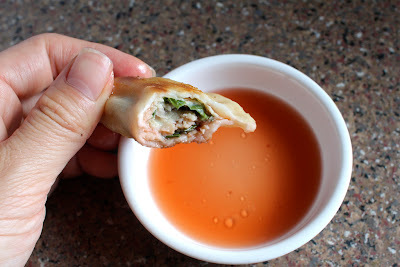 Take a dumpling wrapper and put about half a tablespoon of filling in the middle, brush a little egg around the edges, fold over and seal the edges. 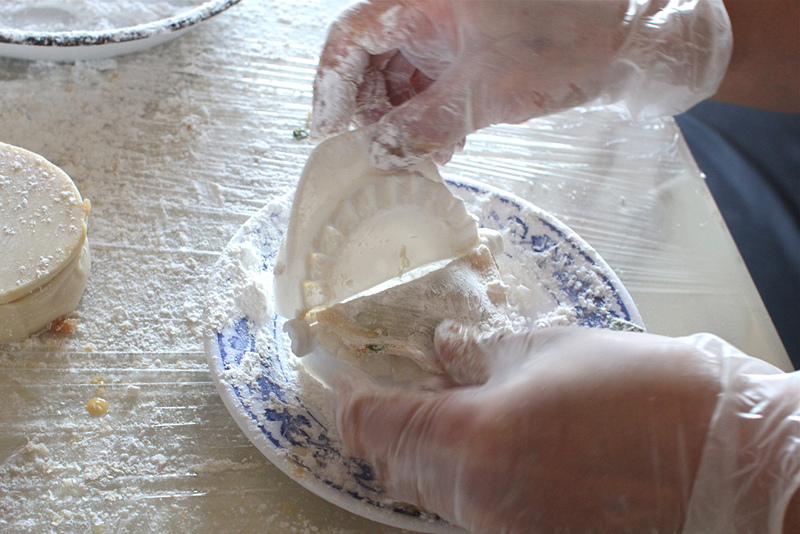 Dust the whole dumpling with some tapioca starch, fit into the curry mould and crimp. Dust the dumpling again with more tapioca starch (this will prevent the dumplings from sticking together when stored). 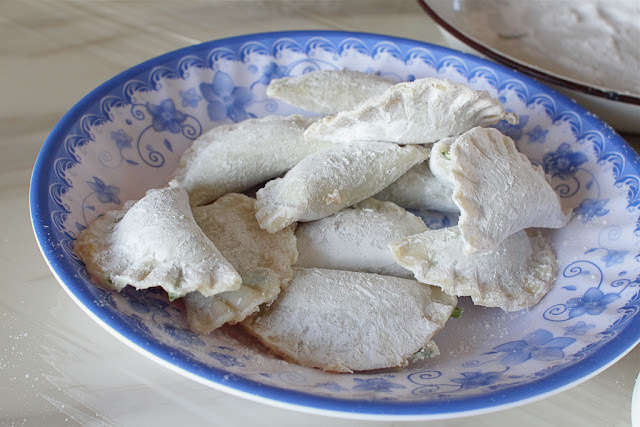 If cooking from frozen defrost first by leaving dumplings in the refrigerator for a few hours or leaving out at room temperature for about ½ hour. This is the usual method of cooking dumplings. 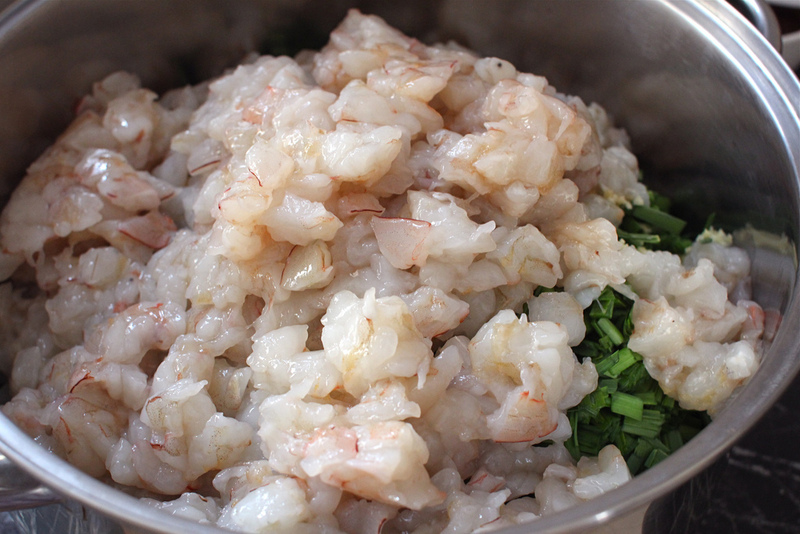 Bring a saucepan of water to the boil, add dumplings and cook over a medium heat for about 8 minutes. When they float you know that they are ready. Serve with your favourite chilli sauce. You can also steam the dumplings. As easy way to do this at home is use a pasta cooking pot with a strainer insert. Bring water to boil, line the pot with a piece of greaseproof paper (with holes poked in). 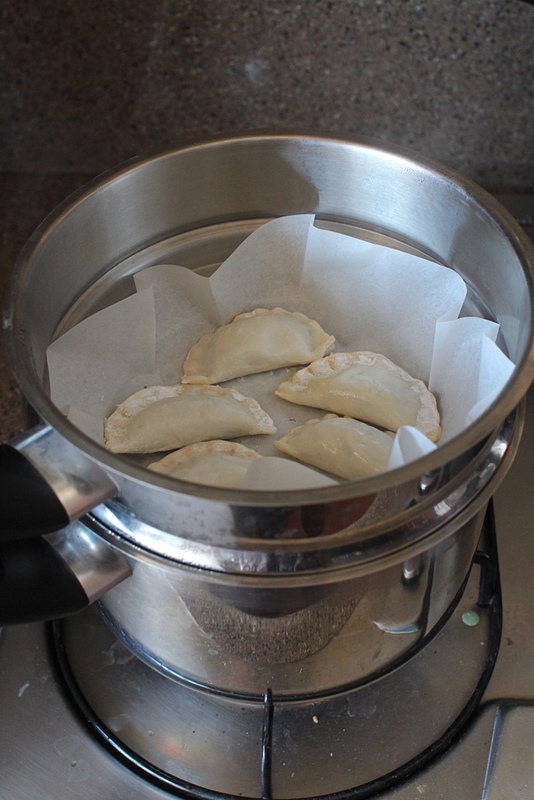 Place dumplings on top of the greaseproof paper, cover and steam for 10 minutes. Heat a little oil in a non-stick frying pan to medium high. 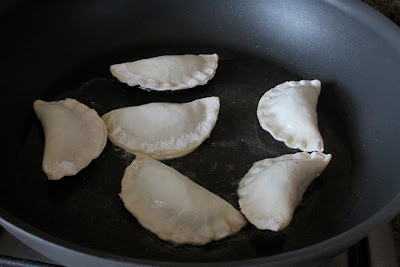 Add dumplings and fry each side for 2-3 minutes until crisp, turning over the dumplings at regular intervals so that they colour nicely. 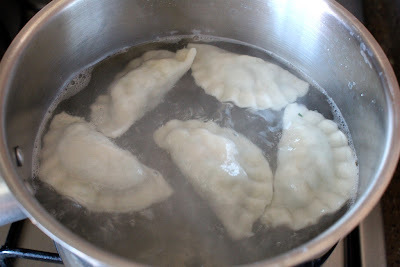 Add ½ cup water into the pan and cover, lower the heat to medium-low and let the dumplings simmer for 4-5 minutes or until the water has evaporated. Uncover the dumplings and if necessary cook for another 1-2 minutes. 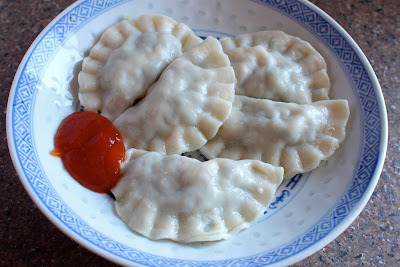 Note: I’ve found that boiled and steamed dumplings taste better with chilli sauce and fried ones are better with vinegar! Your dumplings look really delicious! Thanks for sharing and capturing the step by step process so beautifully. I'm in love! I use a crimper thing too. I know it's proper to pleat but I think being able to do that is genetic and it's just not me. :) One of these days I'll have a crack at pleating but until then, it's the crimper. 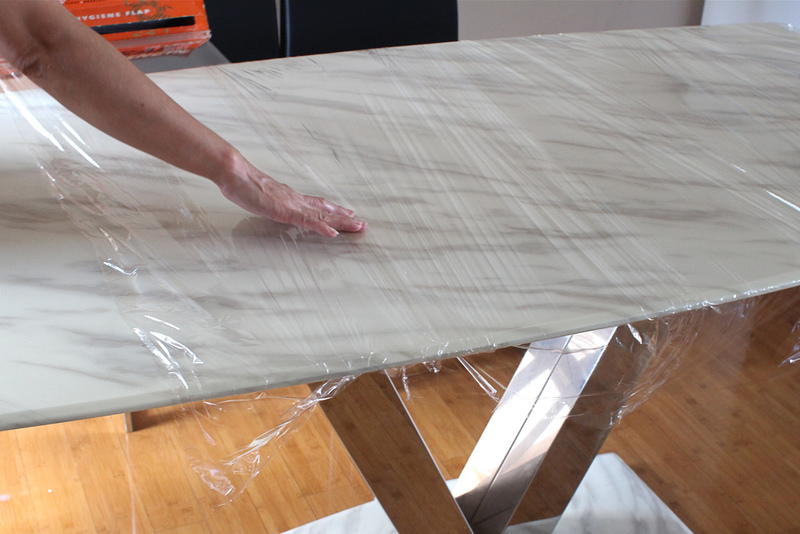 What a great idea to put the cling film on the table. Your mum is pretty swish! My mum likes to avoid cleaning so she will do anything to minimize mess!